Portugal will face Uruguay in the last 16 after advancing as runners-up of Group B, but Queiroz insisted Ronaldo deserved to be sent off for catching Iran defender Morteza Pouraliganji with an elbow to the face. "I don't want to talk too much, it's about my country and a player. I know it'll be a war against me," said Queiroz, who coached his native Portugal at the 2010 World Cup. It was a busy evening for the video assistant referee in Saransk as two penalties were awarded upon review, on top of the Ronaldo altercation. "We accepted human mistakes before, that was part of the game. Players make mistakes, coaches make mistakes and referees make mistakes," said Queiroz. "But now you have one system that cost a fortune. It's high-tech with five, six people inside and what happens? Nobody takes responsibilities. "We need to be like rugby. When there is a decision by VAR I need to know what the referee is saying to them, people need to know what is going on." "So in my opinion, Mr. Infantino and FIFA, everybody agreed that VAR is not going well," he added. "That's the reality, there's a lot of complaints." Ricardo Quaresma struck a brilliant opening goal with a trademark curling effort using the outside of his right foot on the stroke of half-time. Ronaldo had the chance to double the lead with a penalty five minutes into the second half after he was upended by Saeid Ezatolahi, but his effort was save by Iran goalkeeper Ali Beiranvand. Portugal defender Cedric was then penalised in stoppage time for a handball, and Karim Ansarifard converted from the spot to give Iran a lifeline. Mehdi Taremi nearly snatched a dramatic winner after a deflected shot rolled into his path, but he fired into the side netting as Iran were eliminated in agonising fashion. Ronaldo cut a frustrated figure after failing to add to his four-goal tally at the Mordovia Arena, suffering the same penalty misfortune as Lionel Messi earlier in the competition. 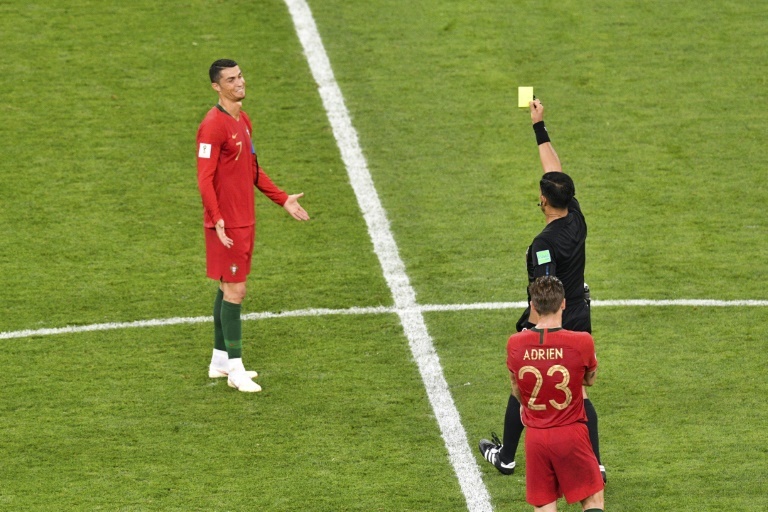 Santos said he thought the referee made the right decision in terms of the Ronaldo flashpoint. "No I wasn't concerned (about a red card), it seemed liked a normal thing in the match. The referee did what he had to do. "He went to the VAR twice or three times, he considered two penalties and one yellow card. I'd have to watch it again to talk about it, but I think the VAR did its job." A late equaliser from Iago Aspas that earned Spain a 2-2 draw with Morocco pushed the European champions down into second place. "To us what is important is to be in the last 16 and we want to carry on in this tournament," Santos said. "Uruguay have high quality and top-notch players. They're excellent but Portugal are too and we're going to try and find a way to win."